Czas trwania: 5 godz. 53 min. 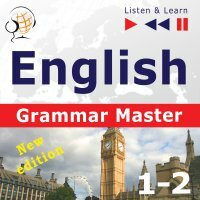 Learn with the "English Grammar Master. Grammar Tenses + Grammar Practice - New edition" course, which gradually teaches you all useful grammatical forms that are necessary for error-free communication in various situations. Why is it worth choosing the "English Grammar Master. Grammar Tenses + Grammar Practice - New edition" course?
? clear explanations with examples from the teacher. The E-book (PDF file) contains the full text of the course: dialogues, test exercises with answers and, in addition, an "Appendix" containing translations of all the grammatical rules into French, German, Polish and Spanish.